A native Floridian, Frank Overstreet grew up on the beach in East Central Florida. Frank attended the University of Central Florida (UCF) in Orlando where he received a bachelors degree in electronic engineering. While at UCF, Frank served two years as an assistant in the micro-controller and robotics courses. U.S. Senator (then U.S. Congressman) Bill Nelson (left) congratulating Frank Overstreet in engineering building at UCF. After graduating from UCF, Frank went to work at ITT Telecom in Cape Canaveral, FL. The project was to make a European signal transfer point (STP) compatible with North American signaling standards. After a few months, ITT decided to completely shut down all it's public North American telecomm operations. From ITT, Frank next went to work for Siemens in Boca Raton, Fl to work on a PBX. At Siemens, Frank Overstreet did software development and testing working extensively with development centers in Europe and California. While at Siemens, Frank Overstreet became interested in the concept of zero customer detectable defect software and proved that it was possible within the existing framework of traditional schedules and resources. While in Boca Raton, Frank also earned a masters at FAU with emphasis on product quality. Frank then returned to Raleigh, NC to work at Nortel successfully applying his skills at zero customer detectable defects to an ISDN PRI central office release. From Nortel, Frank then went to Ericsson in Raleigh where he again applied his zero customer detectable defects skills to cellular telephone software. At Ericsson which became Sony-Ericsson, Frank tested AMPS, TDMA and GSM software primarily at the protocol level. Taking a chance on a family startup, Frank went to work with his brother creating a state chartered bank. In a startup, you wear many hats. Frank began web development which proved to bring in substantial business in an intensely competitive industry. Frank also oversaw quality and regulatory compliance. Another hat he wore was marketing, training and IT support. In a startup, timing can be everything and the timing wasn't right. The recent banking crisis coupled with declining economy brought an end to the effort. Frank then went to B. Robinson Corporation, a professional engineering startup where as a consultant, he does web development, IT support, quality assurance, testing, marketing and bid proposals. Frank volunteers time, skills and tools to those in need and a variety of causes. 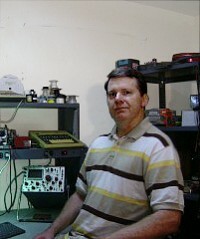 He is a member of the Triangle Linux Users Group and Raleigh Area Amateur Radio Society.